Thanks to your interest and comments, we have an exciting new phase of last winter’s highly successful fundraising program. As a result of the huge response from so many Veterans, Museum members and supporters, we now plan to run this program on a continuous basis, with special emphasis during the winter months. We’ve also added two new benches for our C-47 Skytrain and B-17 Flying Fortress that will stay outside in our Commemoration Park. So how’s it work? By making a $100 donation by 31 March 2017, you can get your name on a plaque on the bench of your choice. You’ll be recognized in our quarterly newsletter, The Hangar Digest and on our website. While the names will be updated on the plaques at least annually (generally in April), the information will go on the website shortly after it’s received. The website “comments section” has been a wonderful conduit for folks who have worked on these planes, flew on them or just like them. Also, it’s been a great journal for family members who have made a tribute to their own special hero. Want to put a loved one’s name on a bench as a gift or a presentation? We can send you a certificate with their name that is suitable for framing. These 8-foot long benches are high-quality plastic-coated rolled steel with cast aluminum legs. They’ve been placed on the ramp near their respective aircraft to complement the static displays. You can start your bench inscription online today by clicking here! You may also view the inscriptions and comments left by others by clicking here. 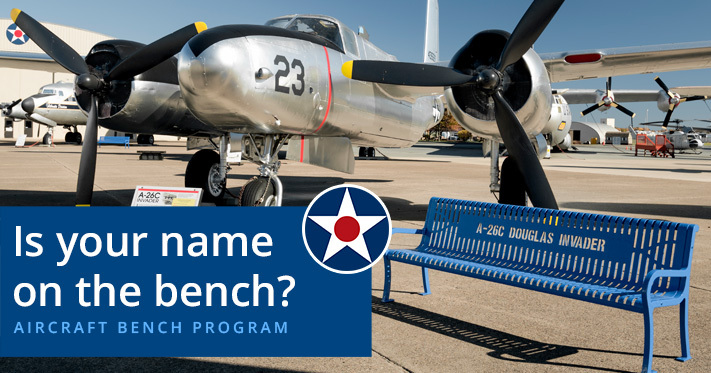 Thank you for your interest in our bench program! Is Your Name on the Bench?